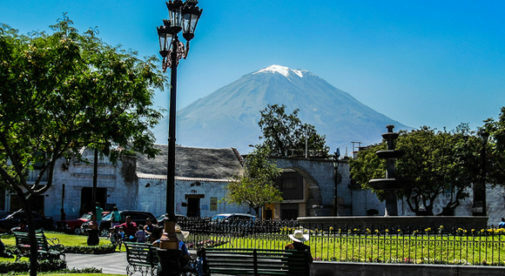 Nestled in a majestic valley in Southern Peru flanked by three volcanoes and the Peruvian Andes is Arequipa—a colonial-style city with an ideal spring-like climate and warm people, known as the gastro capital of Peru. Restaurants are diverse and plentiful in Arequipa, offering popular Peruvian cuisine, local dishes known as Cuisine Arequipa, and international favorites. While there are some pricey fine-dining establishments in Arequipa, you’ll find a broad selection of down-to-earth places that serve great meals at remarkably low prices. Because of this, many expats here go out to eat for the majority of their meals. Here are five great meals you can get for $5 or less in Arequipa. One of the most popular dishes in all of Peru is Pollo a la Brasa (rotisserie grilled chicken). The chicken is marinated then cooked in a rotisserie grill oven. The marinade may include soy sauce, paprika, pepper, garlic, chili peppers or lime. The rotisserie grill oven produces a tender and evenly cooked golden-brown chicken. 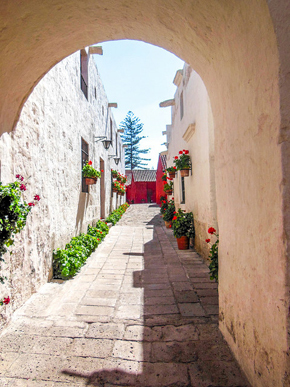 As you walk down the colonial streets of Arequipa, you’ll notice a blend of European and native architecture. After grilling, the chickens are quartered, producing two breasts with wings and two legs with thighs. You’ll find places serving Pollo a la Brasa all over Arequipa. A quarter of a chicken served with a salad, fries (or rice), and drink is often priced at $3. After grilled chicken, one of the most popular cuisines in Peru is Chifa (Cantonese food as adapted by Chinese immigrants in Peru). Popular Chifa dishes include Arroz chaufa (fried rice with pieces of vegetables, meat, and egg) and Tallarín saltado (sautéed noodles with meat and vegetables). An Aeropuerto (airport) is a delicious mixture of both these dishes. Chifa uses a variety of meats as well as fish, but chicken is most common. Chicken dishes include sautéed chicken and vegetables, garlic chicken, and sweet-and-sour chicken. A restaurant that serves Chifa cuisine is also called a chifa. You’ll find chifas scattered throughout Arequipa where a tasty meal costs just $2 or $3. Adobo Arequipeño is a local dish. It’s a pork loin steak in a broth that’s slow simmered in a clay pot. While recipes vary, the pork is usually cooked in chicha de jora (a corn-based beer) with rocoto chili peppers, garlic, oregano, and cumin. Adobo sometimes includes a thick slice of bacon and is always served with fresh bread (for dipping into the broth) and tea—it’s a full meal. By custom, adobo is served on Sunday mornings, starting as early as 4 a.m. and finishing a little after midday. Some all-night partiers go out for adobo when they leave the clubs, while others enjoy it as a Sunday brunch. While adobo is served at many places that serve traditional Arequipan food, the most famous place for adobo may be Adobos Elsita located at Plaza Cayma #306. The cost for a bowl of adobo, bread, and tea is about $4. Empanadas are stuffed pastry bites found in Spain and many Latin American countries, including Peru. While some countries have a few popular fillings, in Peru you’ll find a broad range of tasty combinations. While Pollo a la Brasa, chifas, and traditional menús are plentiful, I didn’t notice as many empanada places. I recommend trying La Empanadita, an empanada and sandwich shop near Arequipa’s main plaza at General Móran Street #121. Here, you’ll find a large empanada stuffed with beef, olive, egg, and raisins, as is popular in Chile. Besides that, you’ll find a shrimp, potato, olive, and onion empanada; as well as a beef, lime, and rocoto chili pepper empanada. These are large empanadas and cost between $1.80 and $2.10. La Empanadita also has a menu of small empanadas—delicious chicken and mushroom, and ham, bacon, and cheese empanadas—which will cost you about $1.20 each. Another popular spot for empanadas near Arequipa’s main plaza is Ribs café at Alverez Thomas Street 107. As the name suggests, it’s a ribs place, but you’ll also find good seafood empanadas here.